What’s with all those dollar bills on the walls? You can order anything from a hamburger with ‘kalua pig’ (the kind you find at a luau) to a mahi mahi burrito. The spectacular view overlooks the ocean. There’s no shortage of paper towels (notice what’s in the buckets on the tables.) 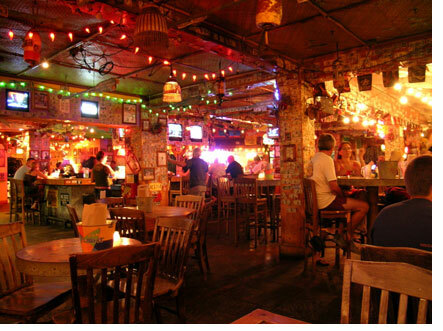 There’s certainly no shortage of atmosphere… and those dollar bills plastered all over the walls? Those are left by people all over the world who sign their name along with a message and tack it on wherever there’s room.